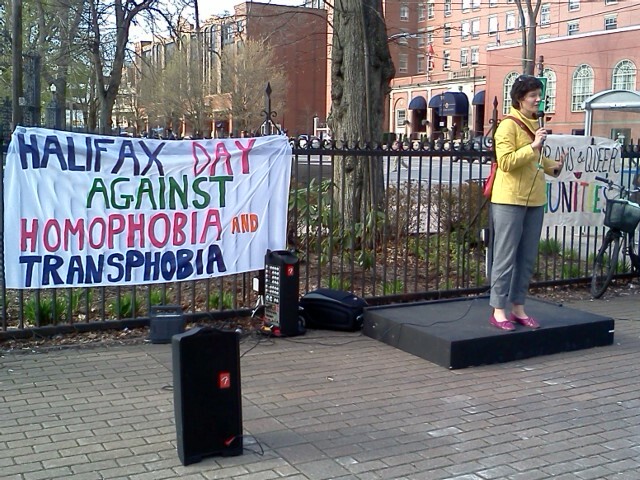 HALIFAX – Megan Leslie, Member of Parliament for Halifax, spoke today at a rally held by the Nova Scotia Rainbow Action Project (NSRAP) in recognition of International Day Against Homophobia and Transphobia (IDAHO). 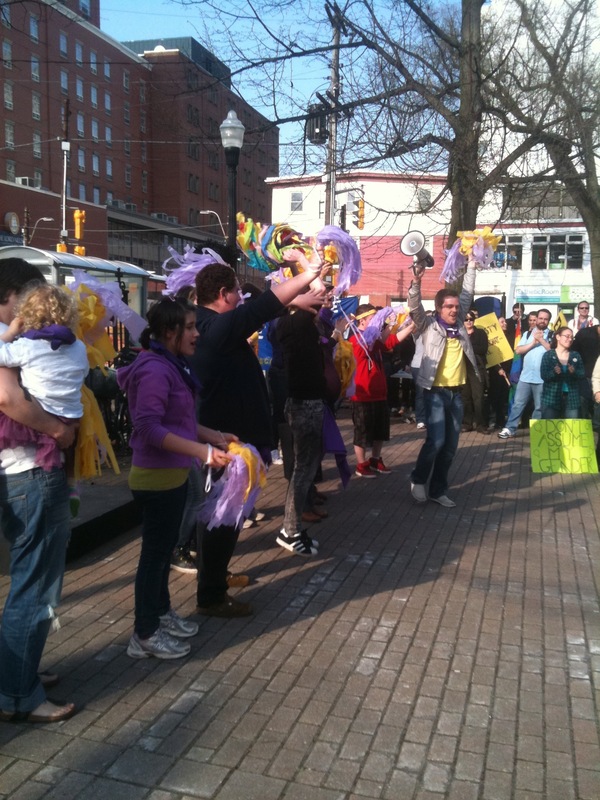 The rally was supported by several local organizations. 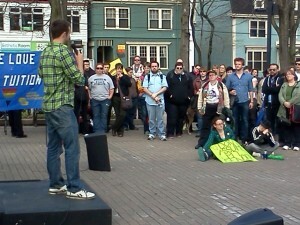 Held annually, the rally also featured speeches from local activists, including Hugo Dann and Keith MacMillan. 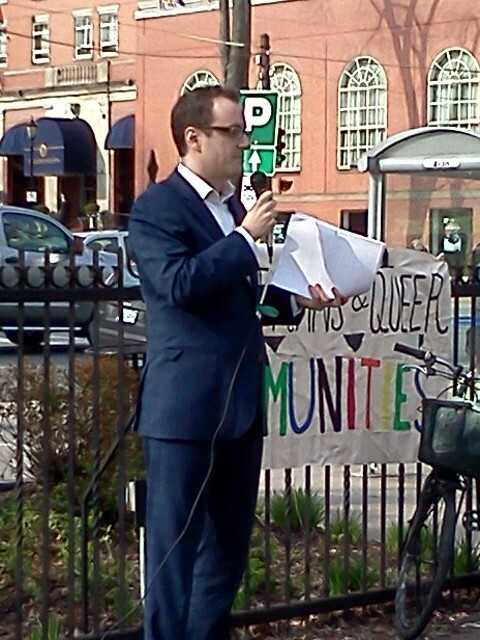 The international struggles of the LGBTQ community and the push to protect transsexual and transgendered people under federal and provincial law were common themes at the event. 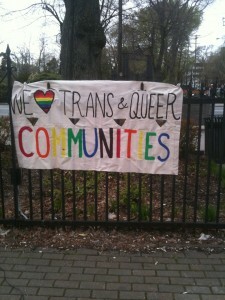 A bill to amend the Canadian Human Rights Act and the Criminal Code to prohibit discrimination on the basis of gender identity and gender expression was passed in parliament in 2010. However, when the federal election was called, the bill died in the Senate. 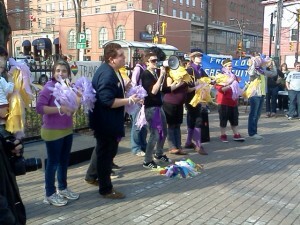 The International Day Against Homophobia and Transphobia is celebrated annually on May 17. This date marks the anniversary of the day that homosexuality was removed from the International Classification of Diseases of the World Health Organization (WHO). 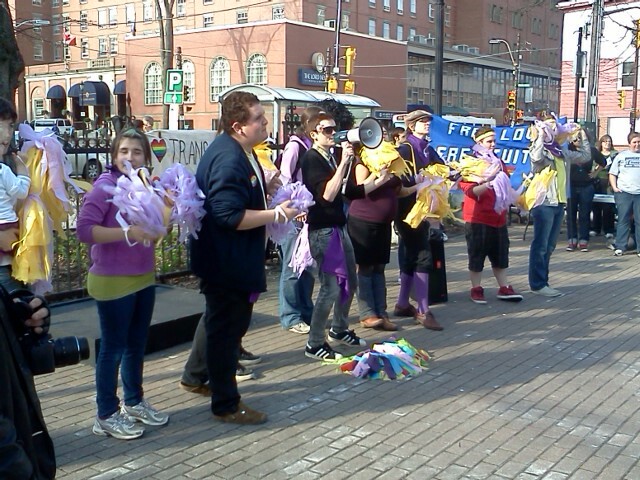 Today’s rally was organized by the Nova Scotia Rainbow Action Project (NSRAP), the Youth Project, the Canadian Federation of Students-Nova Scotia, PFLAG Canada (Halifax Chapter) and the AIDS Coalition of Nova Scotia. For more information on NSRAP, an organization serving and advocating for the LGBTQ community in Nova Scotia, please visit http://www.nsrap.ca. For more information on IDAHO, please visit http://www.dayagainsthomophobia.org. Megan Leslie, Member of Parliament for Halifax, spoke today at an anti-homophobia and transphobia rally. The rally, held by the Nova Scotia Rainbow Action Project, addressed the ongoing international struggle of the L-G-B-T-Q community. Ms. Leslie said that she is confident that the work of opposition MPs will send a clear message that Canadians will not tolerate intolerance. 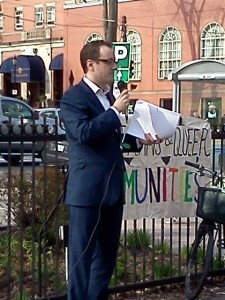 Other speakers at the rally included local activists Hugo Dann and Keith MacMillan.